The mention on radio this morning that our President Jacob Zuma has 40 000 Facebook fans and 87 000 Twitter followers served to remind us that we have not yet had a response or even an acknowledgement to our letter of 6/02/2012. Please be advised that should we not hear from you by close of business at the end of this week then we will pursue other options available for relief. 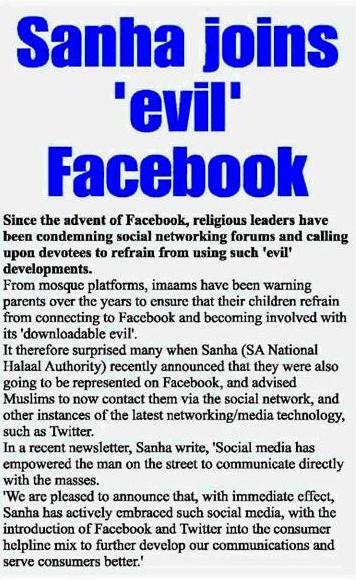 We refer to the article published on page 16 of the Lenasia Sun, end January edition entitled ?SANHA joins evil Facebook.? The further reference to children becoming involved with ?downloadable evil? is malicious in context with our work and mission. On the contrary it could be conclusively demonstrated that many of the country?s Islamic Institutions and their leadership utilise social media. We therefore request the decency of an apology and an undertaking that you will redress the matter with a retraction in next edition of the Lenasia Sun. We pray that you will comply with our reasonable request within the next few days and bring closure to this matter and avoid unnecessary acrimony.